Obviously, the sphere of influence becomes smaller as we go from Federal down to a State, down to a District, down to a Principal, and finally to a teacher, who probably influences the learning of only about 25 students. Naturally, we are then attracted to the level that can bring the biggest impact. A principal, for instance, can influence not just one classroom, but all the classrooms in his or her school. Of course, why should we stop there, when a school board can influence all the principals in a district. Even bigger, the state can influence all of its school districts. This amounts to influencing the learning of hundreds of thousands of students. Ultimately, we are attracted to the Federal level where change can affect millions of students. This indeed sounds reasonable but what Willingham then points out is the irony that a larger influence often leads to a smaller impact on student learning. Thus, he arrives at the first guide: "stick as close to classrooms as you can". It is truly easy to lose sight of what actually happens inside a classroom when we are attracted to flashy toys, sound bites, and lofty goals. But we must remain grounded on what we want our students to learn, and on how we are going to achieve that learning. We therefore need to fill positions of education policy-making with individuals who remain in tune with classrooms in our schools. Ricardy started as a teacher in Marlton Elementary School in Prince George's County, Maryland. After three years, she moved to a middle school teaching English/Language Arts. She then became an assistant principal at Montpelier Elementary School. She pursued a Doctor of Education degree at the University of Pacific in California. In that state, Ricardy served for two years as vice-principal at Neil Hafley School, and as a principal for three years at the Hayward Unified School District. She then returned to the DC area serving as Director of Teaching and Learning for the District of Columbia Public Schools. 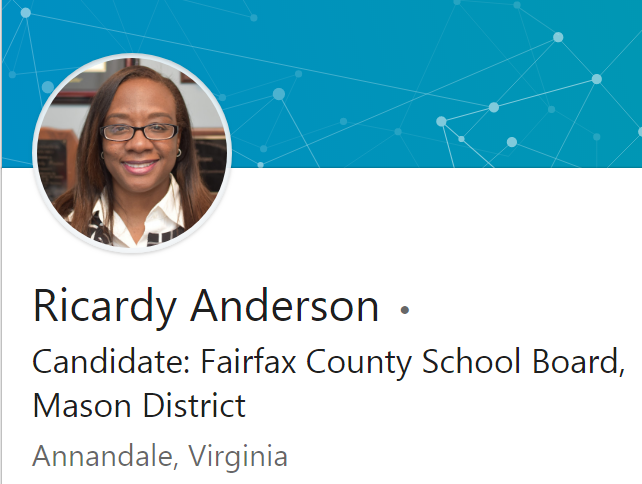 Most recently, she acted as principal for almost eight years in two schools in Loudoun county, Cardinal Ridge and Waterford Elementary Schools. I know Ricardy personally since she sends her two children to the same elementary school my children attend. We have had conversations on current issues schools in Fairfax county face and she definitely comes from a genuine perspective of what is actually happening inside the classroom. She pays attention to fundamentals and this is what our schools need.